Moles are one of the most common reasons that people see a dermatologist. Everyone has them, they can occur anywhere on the skin, and they can change over time. Moles can be skin-colored, pink, tan, blue-black or a variety of other colors, and can come in a variety of shapes and sizes. Some moles may have a higher risk of transformation to a type of skin cancer called malignant melanoma. This risk may be increased by exposure to sun or to indoor tanning. Moles with irregular colors or shapes, or those with rapid or irregular growth patterns, should be checked by a dermatologist. If the mole is concerning, it may be sampled using a procedure called a biopsy. Biopsy is a technique whereby your doctor will remove all or a portion of your mole, and have it reviewed under a microscope to look for cancerous or atypical change. You may or may not get stitches after your biopsy, but you will always get numbing medicine so that the procedure itself does not hurt. You will also be taught how to take care of the biopsy site while you are awaiting your results. You will usually get an answer within a couple of weeks, telling you what the mole looked like, and if further surgery or monitoring will be required. 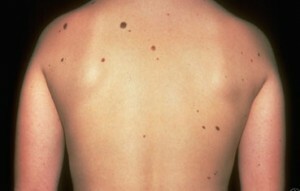 Some patients have a large number of moles, or many moles on an area of the skin that they cannot easily monitor themselves for changing moles, such as the back. In those cases, your doctor may wish to schedule routine skin checks to ensure that any changing moles are found early and removed as needed.